Today the American Dream seems to be in a perpetual time out and regulators in Washington appear to be in the driver’s when it comes to the nation’s housing policy. The negative rhetoric and the enforcement environment are hurting everyone -- homebuyers, lenders and the stewards of the nation’s economy. Housing policy is failing today and the laundry list of examples why, is endless. When the rate checker tool doesn’t live up to the CFPB’s own regulatory standards; when the use of false claims is an overreach for even minor immaterial errors; when legislation and proposed rules are targeted toward both banks and non-banks of any shape and size; when a complaint database is launched that contains unverified claims without the opportunity for all sides to be represented; the list goes on. Regulatory and enforcement overreaction has become counterproductive to the point of failing credit-worthy borrowers. The question must be asked: what can be done? I couldn’t agree more. Let’s fix the broken system, put balanced regulation in its place, and use enforcement as a last resort. We can help if Washington would be willing listen. What lenders need, and what the housing market really needs, is operational clarity. Right now there are different rules based on how you do business. In fact, there are different rules and even different exemptions based solely on certain business models. If the industry cannot understand this complex lending environment, how can a consumer? Moreover, consumers anticipate, per the promise of the CFPB, that they are equally protected regardless of where they get their loan. Regulation by business model moves away from that, to the detriment of the consumer. Also we must change the dialogue. We’re operating the safest, soundest lending environment in decades. Consumers should feel confident in applying for loans and purchasing homes. Policymakers should champion this environment and run a victory lap to let consumers know they are well protected and that they can trust the system. Additionally, I cannot stress enough how much words matter. Regulators should understand the power that their message has over the mortgage market and how this influences behavior. For example, when Chairman Janet Yellen speaks, markets move. When regulators continue with negative messages about the lending community, it fosters fear in consumers and they won’t engage in homebuying. Finally federal officials should work with the industry and stakeholders to change the rules in order to modify the tangled web of confusing regulations that is stifling innovation in the mortgage market. We have some of the best business and economic minds in the world in our industry, but their hands are tied with overwhelming bureaucracy and fear of enforcement. So let’s fix the rules and unleash responsible innovation on a broad scale to help more qualified borrowers obtain a sustainable loan, increase originations, and reignite the mortgage market as a driving economic engine. The industry is doing our part. Now, it’s time for Washington to do its part. MBA could always use more support. If you are interested in joining MBA, and want to know how you can help bring change to Washington, go to www.mba.org. Dave has more than 30 years of experience in mortgage finance and has held several executive level positions in sales, acquisition, investment, risk management and regulatory oversight, including positions in senior management with Wells Fargo, Freddie Mac and World Savings. Prior to his appointment by the Obama Administration to serve at HUD, Dave was President and COO of the Long and Foster Companies. Purchase loans as a percentage of lenders' overall mortgage volume eclipsed 50 percent in April, according to the April 2015 Ellie Mae® Origination Insight Report. Last month’s overall purchase share of 52 percent represented a 6 percent jump from March. 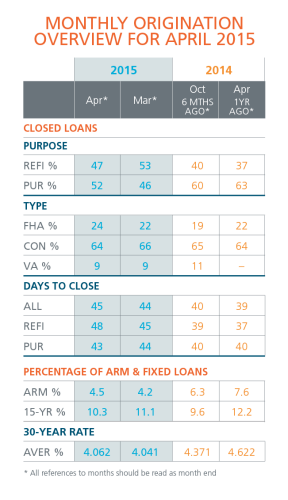 Per this latest report, the average closing period for all loans rose from 44 to 45 days. Meanwhile, the overall closing rate on all loans exceeded 65 percent for the first time since reporting began in August 2011, reaching 65.2 percent. “An improving economy and ongoing attractive rates seem to be contributing to the rise in purchase percentage as we move full speed into the spring buying season,” said Jonathan Corr, president and CEO of Ellie Mae. The Origination Insight Report mines its application data from a robust sampling of approximately 66 percent of all mortgage applications that were initiated on the Encompass® all-in-one mortgage management solution. Ellie Mae believes the Origination Insight Report is a strong proxy of the underwriting standards employed by lenders across the country. It wasn’t long ago that RESPA-TILA seemed so far in the future that it didn’t feel like a reality. That has changed. It is very real, almost here, and preparedness needs to happen now. Taming this regulatory beast means updating workflows, fine-tuning processes, and elevating quality assurance. Delivery times, tolerances and GFEs will all change. It is a lot to undertake, but it can be done. There actually are ways to tame RESPA-TILA without sacrificing quality or efficiency. Ellie Mae® has prepared an informative RESPA-TILA Taming Guide. Available for download, it outlines six tips that can help lenders better understand – and therefore manage – RESPA-TILA. It is available for download now, and is recommended for anyone that understands the enormity of RESPA-TILA and recognizes that smart preparation is the only way they can tame this looming regulatory regulation. The Encompass Title & Closing Center allows you to access most title companies and title agents as well as order closing documents without having to leave the secure Encompass environment. We’re expanding the breadth of data and enhancing the automated workflows within the Encompass Title & Closing Center. The enhancements will include approximately 275 new title and recording fields. The Encompass Title & Closing Center enhancements follow the release of Encompass 15.1 – our new version hardwired to handle RESPA-TILA. PLEASANTON, Calif. – April 30, 2015 – Ellie Mae® (NYSE:ELLI), a leading provider of innovative on-demand software solutions and services for the residential mortgage industry, today reported results for the first quarter ended March 31, 2015. “We had a great start to the year with an outstanding first quarter,” said Jonathan Corr, president and CEO of Ellie Mae. “In addition to another highly successful Encompass user experience, the quarter ended with financial results that exceeded our revenue, net income and adjusted EBITDA objectives. Our clients closed more loans than expected due to origination volumes that were above initial industry forecasts, but our customers also outpaced the mortgage industry as a whole. On top of this, our active user base increased by nearly ten thousand seats and we continued to drive customer adoption across our product portfolio. Combined, these factors helped grow average revenue per user by 38%. Our results demonstrate the leverage in our business model when expectations are exceeded across multiple fronts. For the full year 2015, revenue is expected to be in the range of $223.0 million to $226.0 million, up from the previously provided range of $203.0 million to $206.0 million. The complete press release may be read here. On May 11, 2015, Ellie Mae® announced that they partnered with DocuSign, Inc. (DocuSign®) to deliver advanced electronic signature capabilities to its mortgage lender clients. Ellie Mae and DocuSign will work collaboratively to integrate DocuSign’s Digital Transaction Management (DTM) platform into Encompass®, Ellie Mae’s all-in-one mortgage management solution, allowing more than 119,000 mortgage professionals and thousands of mortgage companies to create an easy, efficient and secure all-digital signing process for their home-buying clients. Ellie Mae® will be attending several national events in the coming months. This provides an opportunity to connect one-to-one, discuss industry trends and happenings, and discover the latest Ellie Mae mortgage technologies. A single system of record. Proven ROI. All in one place. All RESPA-TILA ready. Encompass by Ellie Mae delivers trusted performance for over 119,000 mortgage professionals.